“Finish Line” co-creators Lisa Rafferty and Joey Frangieh. 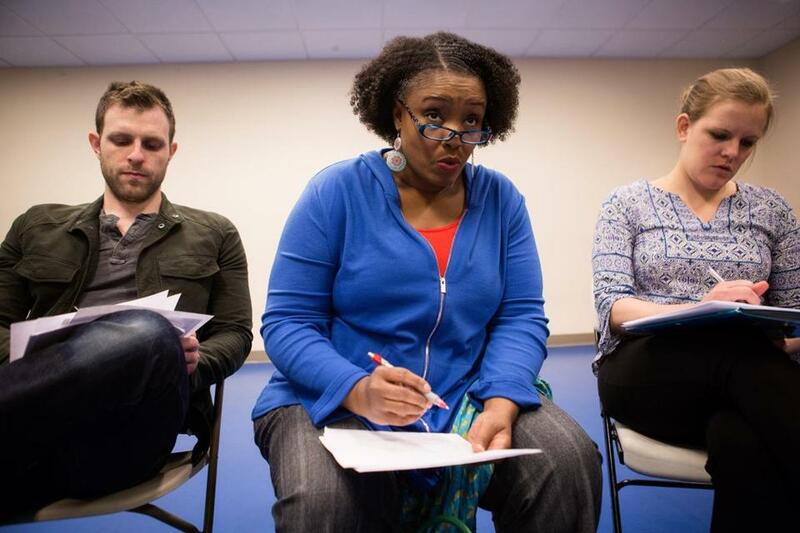 After the first table read for “Finish Line,” Boston Theater Company’s new production based on interviews with dozens of people closely affected by the 2013 Boston Marathon bombings, Liana Asim went home and told her husband she wasn’t sure if she could go through with the show. The invited audience members at that first walk-through, many of them survivors, had stricken looks on their faces, Asim recalls. Many were crying. The material was raw, upsetting, sometimes brutally graphic. She had a hard time imagining delivering her lines six nights a week. Recalling the conversation, Asim let out a big sigh. “Yeah, I could do that,” she said. Two years in the making, featuring excerpts from 88 candid interviews with runners, spectators, first responders, doctors, journalists, and many more, a developmental production of “Finish Line” runs April 7-23 at the NonProfit Center, near South Station. The show is scheduled for its world premiere next year, in conjunction with Citi Performing Arts Center, which operates the Wang and Shubert theaters. The collaboration between the small theater company and Citi is unique. The performing arts center is investing in the development of the show and will lend marketing support. The venue for the 2017 premiere has yet to be decided. Based on an idea conceived by Boston Theater Company artistic director Joey Frangieh and theater veteran Lisa Rafferty, who produces the Elliot Norton Awards for the Boston Theater Critics Association, “Finish Line” is a documentary play in the mold of “The Laramie Project” and the verbatim theater of Anna Deavere Smith. In the theater class she teaches at Bridgewater State University, Rafferty had a student in the National Guard whose unit was called up in response to the bombings. 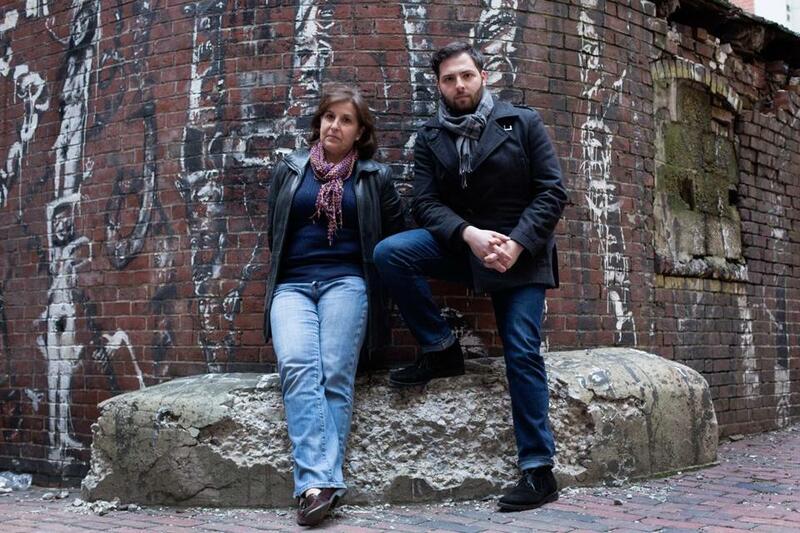 Sitting together on Boston Common a few months after the attacks, Rafferty and Frangieh realized they’d both been considering ways to address the city’s experience through theater. Nile Hawver, Liana Asim (center), and Amie Lytle. In the aftermath of the tragedy, Frangieh, 26, found himself distressed by the amount of media attention directed toward the Tsarnaev brothers, who set off the homemade bombs that killed three people and injured more than 260 others. Speaking one day after the recent terrorist attack in Brussels, the Westwood native acknowledged, “There’s always going to be crazy people who want to watch the world burn.” He wanted to focus his interest in developing “Finish Line” on the good, not the evil. For the co-creators, a fictionalized interpretation of events felt out of the question; they quickly agreed to conduct interviews that would become the basis for a documentary play. After fretting about getting survivors to participate (“We were worried we’d get three people,” Frangieh said), doors began to open as the process took shape. With interviews conducted by a team of volunteers, notable subjects included Boston Police Commissioner William Evans, news anchor Maria Stephanos, bombing victim Lee Ann Yanni (who returned to run the Marathon in 2014) and Liz Norden, the Wakefield mother with two sons who each lost a leg in the attack. Frangieh, a lighting and projection designer whose recent credits on Broadway include hit shows based on the lives of Gloria Estefan and George Takei, said “Finish Line” will attempt to make an immersion experience out of an unconventional performance space at the NonProfit Center. The show ends with an inspirational song written by Frangieh. 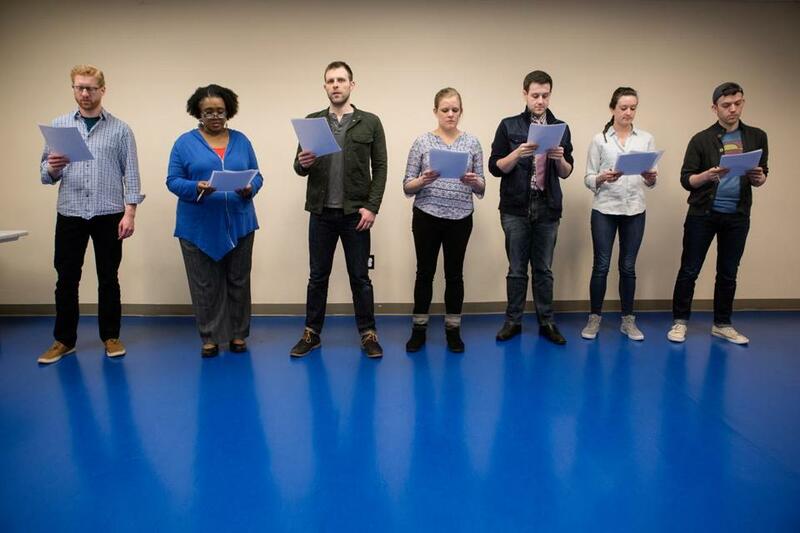 When the song ended at that first table read two years ago, there was a heavy moment of awkward silence, followed by a resounding wave of applause, and plenty of tears. For Frangieh, it’s a story with particular heft for Bostonians, of course. But it’s also a story with universal appeal, about the strength of the human spirit. “Would I be lying if I said we’re not stopping till Broadway?” he said. Rafferty still chokes up at the stories of love and healing she, her co-creator, and their cast of 10 are safeguarding. “Eventually I will stop crying,” she said with an apologetic smile. For her, the trials of continually reliving some of the sadder stories of the bombing have been tempered by the words of one participant in particular. Richard Webster, the music director at Copley Square’s Trinity Church, has been running the Marathon for years, typically in costume. To Webster, the key to the city’s resilience was not just the community’s strength, immortalized in the indelible phrase “Boston Strong,” but its kindness. Asim, who has three roles in the production, moved to Greater Boston with her husband and their five children five years ago. Three days after the 2013 Marathon, she attended her regular Thursday morning prayer group. From left: Ed Hoopman, Liana Asim, Nile Hawver, Amie Lytle, Greg Maraio, Gigi Watson, and John Tracey at a “Finish Line” rehearsal. James Sullivan can be reached at jamesgsullivan@gmail.com. Follow him on Twitter @sullivanjames.